1. 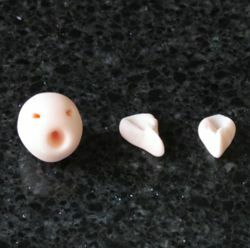 Petal paste is used for all types of modelling e.g. flowers and other intricate designs. 3. 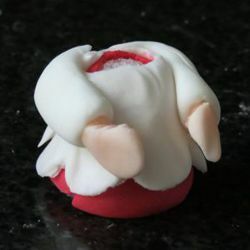 Mix the two types of icing together in equal amounts to make petal paste go further. It can only be used for semi fine work. 4. 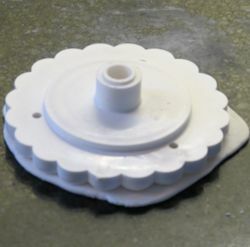 While working with either paste but more especially the petal paste, keep covered at all times. It will dry out extremely quickly and be impossible to work with. Use cling film or a small polythene bag. 5. Both pastes can, of course, be coloured. Use a good quality paste but use sparingly at first. These pastes are highly effective but very strong and it is easy to ruin a batch of icing by tipping too much colour in. Obviously for deep colours this is not so critical. Remember, you can add more but you can't take it out!! 6. Both pastes can be frozen but will need to be kneaded well when defrosted. If the mix is too dry, add a little white fat (Trex) which will soften the paste. 7. 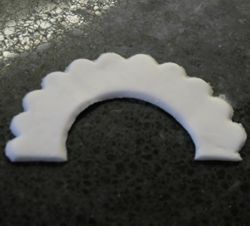 If you don't want to make Confectioners Glue you can use egg white but ensure to give it a light beat first. 8. If you enjoy decorating and want to practice, ice an upturned cake tin and use that! 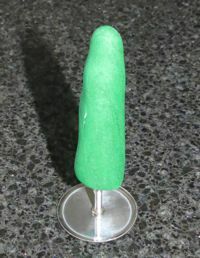 Roll out a green cone. 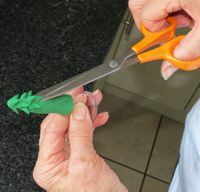 Holding the base, snip with scissors as shown to the bottom. 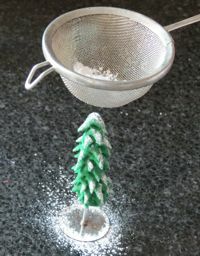 Simulate snow by sieving over icing sugar. Baking the bells is critical...if they are baked too long the middles cannot be scooped out and if they have not had enough they will collapse as you 'scoop'. 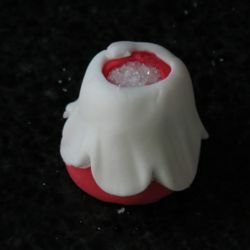 Practise makes perfect and the 'scooped out' sugar can be used for more bells or to sweeten a welcome 'cuppa'!! 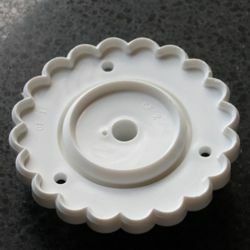 You will need the plastic bell moulds available to buy on line. Add VERY LITTLE water...just enough to slightly dampen the sugar, it should till look granular. 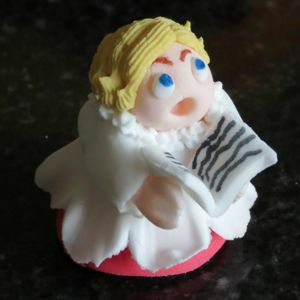 Fill the plastic mould and press in firmly. 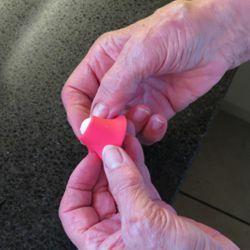 Turn out onto a foil covered piece of stiff cardboard by placing downwards with a firm push. As soon as they are out of the oven, hold gently in the palm of your hand and scoop out the still soft middles with a sharp knife. Leave to dry thoroughly before use. N.B. 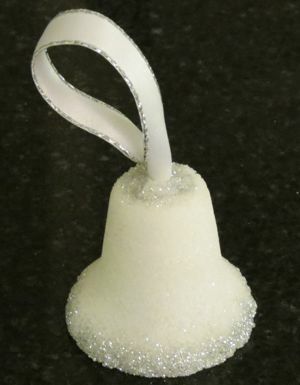 As well as using on cakes, the larger bells look terrific with a looped ribbon through the top, glitter around the edges (use glue) and hung on the Christmas Tree - they will last for several years!! 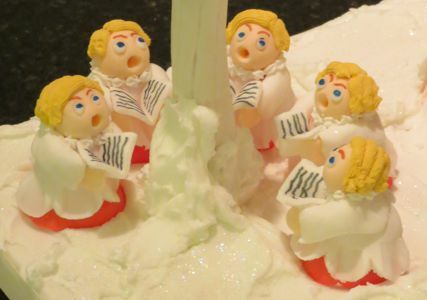 USE FLOWER PASTE FOR THE CHOIR BOYS AND CHRISTMAS TREES, IT IS MORE ROBUST. 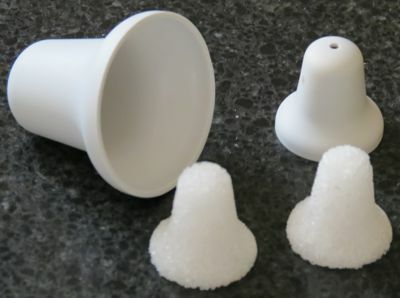 Make a small sugar bell (Instructions above), leave to dry thoroughly. Roll out red paste as per the shape above - not too t hick. 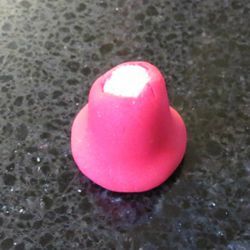 Using confectioners glue wrap around the sugar bell and secure. Roll out a circle of white paste. 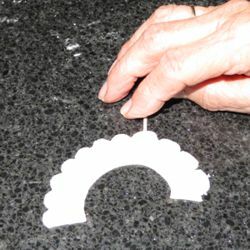 Using a frill cutter press out a circle. 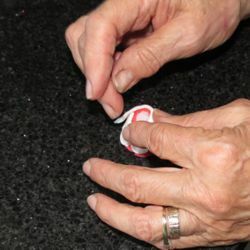 Frill the edges by rolling back and forward with a cocktail stick. 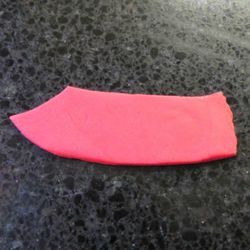 Wrap around the red base ensuring you leave red showing at the bottom and glue. 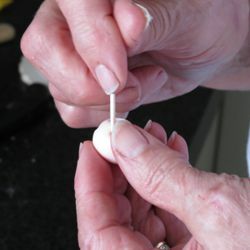 Make small hands by rolling 2 small balls in the flesh paste and slightly flattening. Leave a 'tail' that will go in the arms. 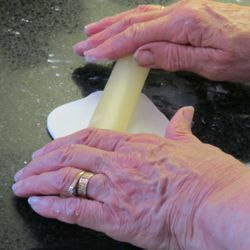 Make 2 arms by rolling out 2 small white 'sausages', make a hole in the ends and glue in the hands facing each other. Glue the head into position. 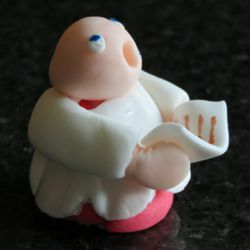 and add a tiny ball of white to the sockets and a blue centre.Make a small songbook using white sugar paste and fit on to the hands. Finish by piping a ring of rosettes around the neck as a 'collar' and piping or spreading on some 'hair'.